It was October 1945, a month after the Japanese had surrendered. World War II was over, but due to poor communications, some enemy forces didn’t realize the fighting was finished. 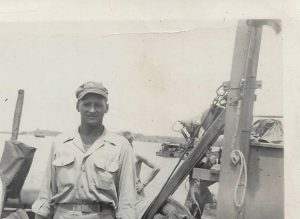 Ensign Stark, anxiously awaiting news of his transfer back to the states, received orders to take his PT 222 and rescue a coast-watching radio outpost from an island just east of Mindoro. It was a stormy day. Large breakers crashed against the shoreline. The PT could get no closer than 200 yards to shore. Skipper Stark ordered the inflation of a lifeboat he would row to the beach and attempt to evacuate the four coast watchers. Paddling in proved to be almost impossible and the raft was upset in the surf three times. Struggling back on board, Stark’s raft was suddenly lifted on a breaker and tossed 50 feet, high and dry onto the sand. Now he needed to get personnel off the beach. Taking two of the radio operators, Stark paddled desperately against the oncoming breakers. Twice they were overturned but all clung to the raft and eventually made it to the PT. Stark’s crew had been battered dealing with the storm-tossed ocean and were not able to help. Although exhausted, Stark needed to return to the beach for the two remaining personnel. The second trip was not as difficult. He was only thrown out of the raft twice. When retrieving the personnel, rather than risk an upset, Stark swam the 200 yards, towing the two evacuees in the raft out to the PT. Completely spent by his efforts, he had to be lifted out of the water onto the boat’s deck. The episode was recorded in a journal kept by one of the crewmembers. This was not a war story involving enemy action, but life-threatening nonetheless. I am proud of my dad, Ensign James Stark, Sr, USN. He should have been recommended for a medal for this action, but many acts of heroism in wartime go unnoticed. I’m had never seen heard that story but I’m not surprised. Our dad was a great guy. Wonderful story. Great tribute to your father. And well you should be proud. My thought like father like son. You are my hero. Thanks for sharing. Wow, incredible tale! Thanks for sharing – I hadn’t heard that one.